Surface replacement of the hip is an alternative to traditional hip replacement for the treatment of conditions such as osteoarthritis, avascular necrosis, and post-traumatic arthritis. It provides a bone-conserving artificial hip joint, and is designed to preserve bone for younger, active patients. The gold standard of the treatment of end-stage hip arthritis for the last 30 years has been a total hip replacement in which the upper part of the femur (the head and neck) are replaced with a stemmed device and prosthetic head (see below). The socket is replaced with a hemispherical shaped cup which usually contains a bearing surface of either metal, ceramic or polyethylene (plastic). Total hip replacement is an extremely successful operation that allows patients to return to pain-free activity and improve their quality of life. Unfortunately, over time prosthetic (artificial) hip implants can wear-out as well as loosen. When this occurs, patients encounter pain, a loss of functional ability and possibly even loss of bone. 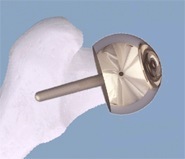 With both traditional hip replacement and surface replacement, the socket is inserted in a similar fashion. The two procedures differ in the way the femur is prepared. Whereas traditional hip replacement involves removing the head and neck of the femur, surface replacement preserves this bone (see picture). With a traditional hip replacement, after this bone is removed, a prosthesis with a stem is inserted within the thigh bone. With a surface replacement, the preserved bone is sculpted to accept a metal cap with a short stem. The preservation of bone has several potential advantages. The first is that more bone is retained in the femur, should another hip replacement become necessary. Over time, any hip replacement may loosen or show signs of wear. In a young, active population, there is a high likelihood that more than one hip replacement operation will be necessary over the lifetime of the patient. It is a well documented principle that the more bone that remains during a revision hip operation, the greater chances of success. The second advantage to a surface replacement is that the preservation of bone allows for a much larger ball size. This allows for greater stability of the hip joint prior to dislocation. The dislocation rate after surface replacement of the hip is about 10 times lower than for a traditional hip replacement. 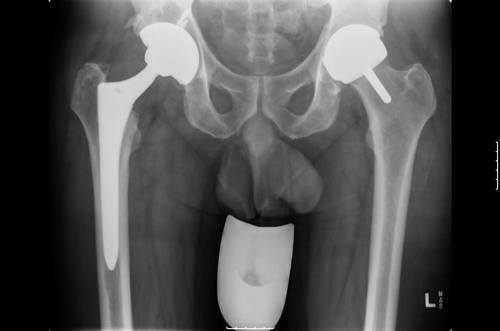 An x-ray of a patient with a total hip replacement on one side, and a hip resurfacing on the other. This clearly demonstrates the bone-preservation as well as the larger ball size achieved by a hip resurfacing. Some of the risks of surgery of the hip include the loss of blood, formation of a clot in your leg, and the chance of infection. The overall incidence of these risks is very small. They should be discussed with your surgeon prior to proceeding with the operation. Some of the risks of having a prosthetic hip include the chance that the ball will dislocate (come out of the socket), the parts may loosen or wear out over time, or the prosthesis may become infected. As the hip prosthesis is a foreign body, it may become infected when there are bacterial infections elsewhere in the body. It is important for patients to be aware of this possibility and make other physicians and dentists aware about the presence of a hip prosthesis. Again, these issues will be discussed with you by your surgeon. The current generation of surface replacements are metal-on-metal bearings. That means both the ball and the socket are made entirely of metal. Although this cuts down dramatically on wearing out of the components, it has been shown to cause metal ions to be dispersed through the body. Cobalt and chromium ions are measurable in the blood stream, but have not been shown to cause cancer or any other disease in humans. Although the metal ions are measurable, no one knows what a safe level is. Generally, people with functioning kidneys are able to excrete the ions in their urine. There is also a rare possibility of developing a reaction to the metal particles that could result in pain or joint swelling. Working around the bone of the femur may cause extra pressure to be put on the nerves in the hip area, specifically the sciatic nerve. This may cause a transient weakness of some of the muscles of the leg in less than 1% of cases. The hip resurfacing procedure may lead to extra bone forming around the hip, leading to stiffness, called heterotopic ossification. We now take measures to prevent this, using either a medication called Indocin, or one dose of radiation to the hip area after surgery. The radiation treatment, known as XRT (external radiation therapy), may be performed in the first 2 days after surgery and does not have any association with cancer. With XRT, the risk of extra bone forming is less than 2%. If Indocin is given to you, it will be a daily medication for 3 weeks post-operative. At this time, it is not clear what limitations of activity patient with surface replacements should adhere to. With traditional bearing surfaces such as polyethylene or ceramics, repetitive impact has been associated with accelerated wear and even potential catastrophic breakage. Whether this will occur with the current metal-on-metal bearings such as those used in surface replacements is not known. The short term results (4-6 year follow-up) of hip resurfacing are encouraging. However, the early failures of hip resurfacing appears to be greater than for total hip replacement (2.2% vs 1.9%), with the majority of the early failures due to femoral neck fracture. Whether the newer forms of hip resurfacing will be successful long term is unknown. It may require 10 years or longer to determine whether this newer form of hip resurfacing is superior to total hip replacement at comparable time intervals. Improvements in hip implant design as well as materials are frequent in joint replacement. Extensive prospective clinical trials over many years are necessary to determine the long term outcome and the true benefits and risks of new innovations. Should you be a candidate for hip replacement, a discussion regarding your options for treatment with your physician is recommended. There is no “right” answer as to whether total hip replacement or hip resurfacing is a better procedure for you. Only your surgeon can advise you on the option best suited for your unique circumstances and if necessary, which procedure is best for you.